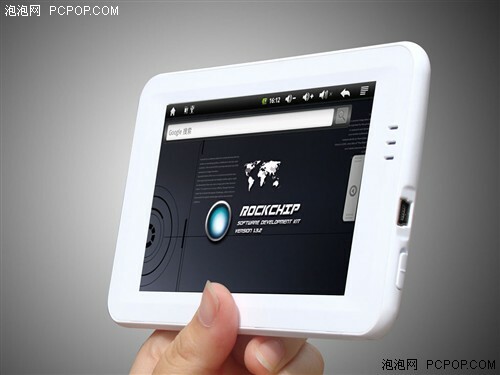 The 5" HOTT MD500 Rockchip based Android 1.5 tablet was recently announced and is now taking local preorders in China. Sellers claim to be ready to ship within the next couple of weeks. Preorder retail pricing on Taobao is currently between 899 to 1000 RMB for now, which is to be expected for a branded tablet with said specifications. This should prove to be a solid competitor to the 5" Ramos W7, which has not been the product many had hoped to be. We expect prices to dip in pricing as the product begins shipment. Engadget reported a prototype of this device back in March, when it was still a generic Rockchip RK2808a prototype that became the Ramos W7. We did not find information about the presence of a g-sensor at this time. The HOTT 500 comes from a more well known manufacturer compared to the typical shanzhai generic devices, as HOTT is a well regarded as a MP3/PMP brand. 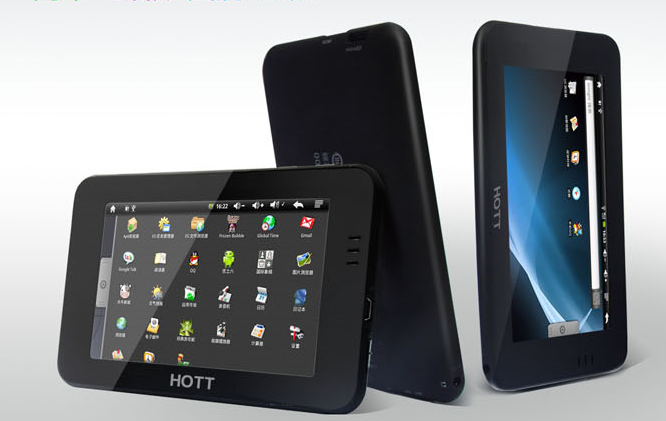 HOTT is from Shenzhen China, and dates back to 2000. Some of its products have acquired the proper CE&#65292;FCC&#65292;CCC, and ROHS certifications in the past, so we possibly may see this device properly retailing on our shores in the coming months in addition to the usual channels. Reports from June indicated that was going to be a tablet based on a Rockchip platform. Retails are advertising the device to be based on the RK2808a, which should be incorrect based on our research. Although formal specifications have not been revealed, the published device performance specifications make it likely this is based on the Rockchip RK2808, which is a variant of the Rockchip RK2808a found in the Archos 7 Home Tablet, the Apad iRobot / Moonse E7001, and Ramos W7, except that it is expected to sport a HDMI output jack. It will come with 128MB RAM as typical with Rockchip devices. Typical battery life with wifi enabled for the RK2808 platform is 2-3 hours, and up to 4-5 hours with wifi disabled for this platform. It is also being advertised with 3G functionality, presumably via USB hosting as with other Rockchip RK2808a variants.